His Vedic Science and Technology, which unfolds the full potential of Natural Law in human consciousness as the basis of improving all areas of life, is regarded as the most effective Program of human resource development. Maharishi's Transcendental Meditation, which is the subjective technology of Maharishi's Vedic Science of Consciousness, is the most widely practiced and extensively researched Program of self-development in the world. His technique of Transcendental Meditation is the most widely practiced and extensively researched Program of self-development in the world. More than 600 scientific research studies conducted during the past fifty-one years at over 250 independent universities and research institutes in 33 countries have validated the profound benefits of Maharishi’s Transcendental Meditation Program for the individual and for every area of society, including health, education, business, industry, rehabilitation, defence , agriculture, and government. Nearly five million people in all parts of the world and from all walks of life practice Maharishi’s Transcendental Meditation. 40,000 teachers of the Transcendental Meditation Program have been trained so far, and more are continuing to be trained. 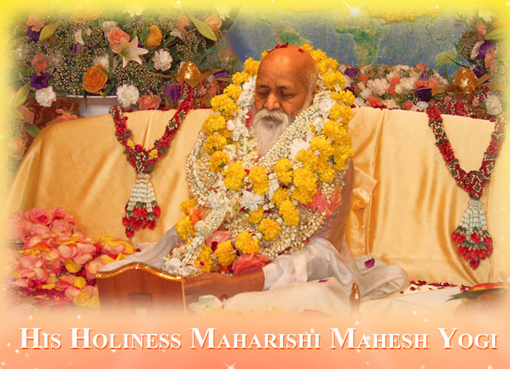 In addition, more than 100,000 people have learn Maharishi’s Transcendental Meditation Sidhi Program and are daily practicing Yogic Flying, an advanced Program of Transcendental Meditation, which dramatically enhances all the benefits brought about by Transcendental Meditation for the individual, and creates a highly purifying influence in world consciousness. Maharishi has held hundreds of World Peace Assemblies on all continents during the past fifty-one years with many thousands of people coming together to create coherence in world consciousness through the group practice of the Transcendental Meditation and Transcendental Meditation Sidhi Program (Yogic Flying Program). In 1986, on the basis of the rising Maharishi Effect—coherence in world consciousness resulting from his World Peace Assemblies—Maharishi inaugurated his Program to create world peace by establishing a permanent group of 7,000 Vedic Scientists in Maharishi Ved Vigyan Vishwa Vidya Peetham, Maharishi Nagar, India, to create coherence in collective consciousness on a permanent basis through the group practice of the Transcendental Meditation and Transcendental Meditation Sidhi Program. As a result of the rising Maharishi Effect in world consciousness produced by millions of people practicing Transcendental Meditation throughout the world, and through Maharishi’s World Peace and Invincibility Assemblies in all parts of the world, world peace is rising to be a permanent reality. Over the past fifty-one years Maharishi has established a worldwide organization with more than 1,200 centres in 108 countries. Hundreds of books have been published about Maharishi’s teachings. These have been translated into many languages and have been distributed globally. Maharishi is one of the most videotaped personalities in history. There are more than 15,000 hours of video and audio tape recordings of lectures in Maharishi’s international film and tape library. Maharishi has completely restored the thousands-of-years-old scattered Vedic Literature for the total significance of its theory and practice, and has organized it in the form of a complete science of consciousness. Transcendental Meditation is the subjective technology of Maharishi’s Vedic Science of Consciousness. Maharishi’s Vedic Science and Technology is a complete science and technology of consciousness; it is the complete science and technology of life, capable of raising all aspects of life to perfection. The practicality of creating the supreme quality of life on earth—Heaven on Earth—through Maharishi’s Vedic Science and Technology has been amply verified during the past fifty-one years by scientific research, which documents the benefits in every aspect of life—physiology, psychology, sociology, and ecology. It has also been substantially verified by personal experience, and by the authenticity of the ancient, traditional Vedic Literature. The global achievements of these fifty-one years, on the ground of tested knowledge, prompted Maharishi to launch a global Program to create Heaven on Earth—life according to Natural Law. The Global Reconstruction Program for Permanent World Peace (http://www.globalreconstruction.org/) calls for the reconstruction of the whole world, inner and outer, and has been established to create life in accord with total Natural Law—Heaven on Earth. Maharishi’s knowledge, Maharishi’s Vedic Science and Technology, Maharishi’s eternal Constitution of the Universe which is present everywhere, and Maharishi’s simple approach for everyone to enjoy life according to Natural Law are the foundation of Maharishi’s global action to create Heaven on Earth and perpetuate it for all generations to come. The revival of Vedic Wisdom through Maharishi’s Vedic Science and Technology and the establishment of Maharishi Vedic University, Maharishi Vedic Medical University, and Maharishi University of Management in many countries provide that perfect knowledge of Natural Law which will forever continue guiding mankind on the path to perfection—daily life in full accordance with Natural Law. A review of all the scientific research on the Transcendental Meditation and Transcendental Meditation Sidhi Program reveals that the sequential unfoldment of pure knowledge and its infinite organizing power has brought about the experience of pure consciousness, has given rise to higher states of consciousness in the individual, and has purified world consciousness, as evidenced by the rising waves of achievement of Maharishi’s Movement throughout the world over the past fifty-one years. Maharishi’s call to the governments of the world and his offer of a practical formula for every government to come in alliance* with Nature’s Government, to gain the support° of Nature’s Government, and gain the ability to nourish everyone and satisfy everyone is so unique and unprecedented in the thousands of years of struggling history of governments that probably the political leadership of the world, working under stress and strain, could not believe that the support of Nature could be gained in a systematic, scientific manner by all. Having realized that it is possible to free governments from problems and develop in them the ability to prevent problems, Maharishi decided to establish a Global Government‡ of Natural Law with its seat in every country. The effect of the Government of Natural Law will be to raise the administration of existing governments through national law to the dignity of Global Administration through Natural Law. In the context of the Absolute Theory of Government it is enough to mention the ideal‡‡ of government available in the Global Government of Natural Law. However, it is necessary to mention that the relationship‡‡‡ of the government of every country with Maharishi’s Global Government of Natural Law will be so elevating and nourishing to every government in the world that every Head of State will enjoy the full support of Natural Law, and his government will enjoy the ability to prevent problems and will substantiate the new definition of government provided by Maharishi’s Absolute Theory of Government. Maharishi’s practical Program is to quietly‡‡‡‡ establish life according to Natural Law without requiring change in any area of the existing administration, which is based on the national constitution of the country. This global initiative to irrevocably change the course of time in favor of peace and happiness for all mankind places Maharishi on a most supremely exalted level of rulership, which far surpasses the wisdom or administrative skill of any sovereign ruler in the world that history has ever recorded. The establishment of Maharishi’s Global Administration‡‡‡‡‡‡ through Natural Law, and subsequently the Maharishi's establishment of the Global Country of World Peace‡‡‡‡‡‡‡ on 7 October 2000, will lead the administrative quality of every government in the direction of perfection so that every government functions on a par with the absolute administration of the universe, the Government of Nature, which is universally nourishing to all life. Brahma, the total potential of pure knowledge and its infinite organizing power—the lively Constitution of the Universe, Natural Law—becomes the charioteer of all activity. Rk Veda assigns supreme rulership to that self-referral quality of consciousness, the total potential of Natural Law—Brahm. The total potential of Natural Law conducts the activity of those who have identified their in intelligence with the infinite organizing power of pure intelligence at the level of self-referral consciousness. Every custodian of Maharishi’s Absolute Theory of Government will have access to this enormous intelligence and power in his own self- referral consciousness—in his own Transcendental Consciousness—in his own physiology. Rk Veda, the Constitution of the Universe, will be enlivened in the heart of everyone, and, through a group of Yogic Flyers, an indomitable influence of harmony and peace will be generated in national consciousness which will influence the whole collective consciousness of the world. Indomitable Maharishi Effect—positivity and harmony—will be maintained in world consciousness, generation after generation. One wonders whether there could be a greater ruling intelligence than the one that is available in the world today in the form of Maharishi, who is making life on earth heavenly, and who is making Heaven on Earth a reality. Maharishi attributes his achievements to Shri Guru Dev, His Divinity Brahmanand Saraswati Maharaj, Jagatguru Bhagavan Shankaracharya of Jyotir Math, Badrikashram, Himalayas—most illustrious embodiment of Vedic Wisdom in the eternal tradition of Vedic Masters. During the past fifty-one years the purity of world consciousness has been steadily rising; the light of pure knowledge has been steadily rising; life according to Natural Law has been steadily rising. It is satisfying that with the blossoming of this Absolute Theory of Government, the world is witnessing the signs of a new awakening in every field in the direction of fulfillment. Now is the time for the world to witness the full glory of life according to Natural Law—to experience the full dignity of life in peace, prosperity, and happiness, with enlightenment and fulfillment in daily life. This is Maharishi in the world today, a quiet guardian of all nations. Through his brilliance in the field of knowledge and administration, every government now has the opportunity to actualize the supreme purpose of government. * 1990—Maharishi’s Year of Alliance with Nature’s Government. * 1991—Maharishi’s Year of Support of Nature’s Government. ‡ In 1976 Maharishi inaugurated the World Government of the Age of the Enlightenment. Maharishi’s Administration through Natural Law—Global Raam Raj—celebrated on 12 January 1993, developed its organizational structure in 1996, on Guru Purnima Day, when Maharishi established Global Administration through Natural Law, materializing the concept of Maharishi’s World Government of the Age of Enlightenment. ‡‡ This is the ideal of the Natural Law Party in sixty countries. ‡‡‡ Every national flag will fly with the cosmic flag of Maharishi’s Global Government of Natural Law. ‡‡‡‡ Maharishi realized the intensity of ignorance prevailing in the political leadership of the world. In his desperate mood to save the world from suffering, he finally decided to produce the effect irrespective of governments. He decided that governments, functioning according to man-made constitutions, completely ignorant of the eternal Constitution of Natural Law, are not able to understand the proposals, plans, and Programs to create perfect administration through the support of Natural Law. He decided to take a self-sufficient path that would not in any way depend on governments. Maharishi decided to create a Global Government of Natural Law to render all governments as really sovereign governments in their own countries and to quietly raise the efficiency of every government on a par with the Government of Nature and thereby substantiate the purpose of government in every country. A global awakening of the failure of governments everywhere, and a global demand from the world press for something new in the field of politics, attracted Maharishi to the field of politics. Maharishi was moved by the logic that the democratic system prevailing in the world invites anyone to enter into government and serve the nation through his knowledge and ability. The discovery of the Constitution of the Universe within the human physiology has given a very solid foundation and strength to Maharishi’s global political Program to transform the field of politics and establish the rule of Natural Law in all parts of the world. Every responsible politician in any country should now turn to the royal road of Administration through Natural Law (which is already quietly administering the activity of all systems and structures of the body), and this will mean that the national government will quietly receive the full support of Natural Law, and positivity and harmony will prevail in national consciousness. There will be conflict-free politics and a problem-free government. National energy will not be wasted in oppositions of political parties, and all the national intelligence will be used for progress. 'It is a very, very great delight for me that I have a chance now, after Puja to Guru Dev, to express to you all, for the world of all times, the establishment of this global organization which has now been established with the blessings of Guru Dev, as the Prasad of Guru Puja. 'This global organization will establish administration through Vedic Knowledge in the center of every country, and this will enliven the organizing power of Natural Law for the government and give invincibility to the government, peace and happiness to the people, and will give nourishing sovereignty to every sovereign nation. in the family of nations—you will hold the balance of power in the world." ‡‡‡‡‡‡ Refer to pages 30–41 of Constitution of India fulfilled through Maharishi’s Transcendental Meditation, Age of Enlightenment Publication, 1999. ‡‡‡‡‡‡‡ The Global Country of World Peace will establish Global Administration through Natural Law by enlivening the nourishing evolutionary power of Natural Law in the life of every individual and in the collective consciousness of the whole world. The Global Country of World Peace has sovereignty in the domain of consciousness, authority in the invincible power of Natural Law, and a parental role in the family of nations.